Planning a Door County trip? Make time to visit The Ridges Sanctuary, a unique nature center and preserve along the “quiet side” of the peninsula along Lake Michigan. The nature center, located right in Baileys Harbor, offers interpretive exhibits and access to an extensive network of trails via a new boardwalk. The Ridges Sanctuary is home to a unique concentration of rare plants and animals, including the largest population of the federally endangered Hine’s emerald dragonfly. The Ridges also supports nearly 500 different plant species, including 25 species of native orchids, 60 different species of birds, and 12 threatened and endangered species. Take a naturalist guided hike so you don’t pass by this wetland’s rarer species. 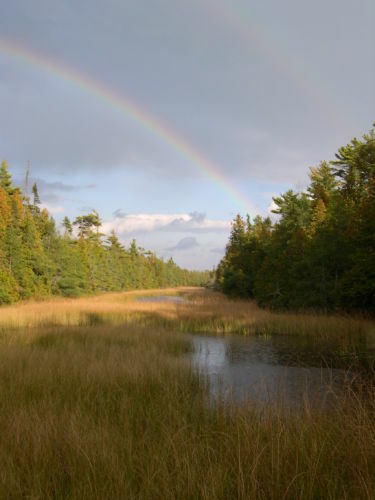 The richness of habitats and species found at the Ridges Sanctuary and in adjacent wetlands have been recognized as not only being rare and significant in Wisconsin, but also internationally. The area is recognized as a Wisconsin Wetland Gem® (called “Moonlight Bay and Connected Wetlands”). It is also one of only 38 places in the United States to be designated Ramsar Wetland of International Importance, joining the ranks of wetlands like the Okavango Delta in Africa and the Everglades in Florida. What kind of wetland is it? Ridges Sanctuary gets its name from its unique topography that underlies one of the rarest wetland types in Wisconsin: ridge and swale. Dry sandy ridges alternate with wet areas (swales), and these alternating dry and wet conditions provide for a great diversity of plants and animals in a relatively small area. Wetland plants grow just a few feet from dry forest species, so there is always something new around the bend. Celebrate and enjoy the beauty and unique nature of this wetland by joining one of the the Ridges’ daily guided hikes, or by exploring the trails independently. Learn more about the Hine’s emerald dragonfly, and even try to catch one, on July 22nd during the Dragonflies of the Ridges event. Learn more about this Wetland Gem®.